The thing is, they already think they know. Salmon—or a lack thereof—is the likely culprit. And climate change is making the situation worse, experts told Earther. J-50 is seen here with his sister. With climate change warming the waters the Chinook swim in, their survival becomes more and more difficult, said Misty MacDuffee, the wild salmon program director at environmental organization Raincoast Conservation Foundation. J-35’s heartbreaking display might have drawn attention to these issues, but the whales and the salmon they depend on have been in decline for years. 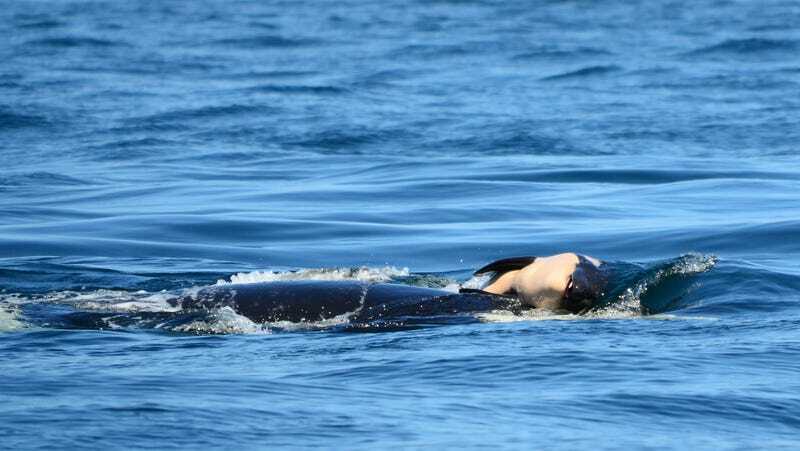 And the Suquamish Tribe off the coast of Washington state has spent decades calling for better protections of their ancestral waters, both for their sake and that of their orca neighbors, said Chairman Leonard Forsman. These animals hold cultural and spiritual significance to many of the Salish Sea Tribes and appear in Suquamish creation stories. “We’ve been standing up for [Puget] Sound for a long time, so for us, this is a symptom of what we’ve been fighting for decades and continue to battle now,” Forsman told Earther. Forsman hopes the creatures can get the food they so urgently need—soon. But he knows it’ll take more than that to save them in the long term.